If you want a taste of the Caribbean life without the crowds and noise of other Riviera Maya hotspots, you should book your trip to the idyllic Mexican beach town of Puerto Morelos. This laidback coastal town is just a hop, skip and a jump away from Cancun, but it feels worlds away from Cancun's busy beaches. This serene, colorful town is the perfect destination for those looking to relax, unwind, and experience some of the best luxuries of the Caribbean. From its striking aquamarine waters to its friendly locals, Puerto Morelos will steal your heart the moment you arrive. To plan your perfect Mexico beach vacation, you should work with Vacatia to book your accommodations. When you rely on Vacatia to book your stay at one of the top Puerto Morelos resorts in the area, you can rest assured that you will feel right at home in this stunning Riviera Maya beach town. Vacatia provides travelers with high-quality rentals in some of the world's most popular vacation destinations, such as Puerto Morelos, where you'll be able to enjoy every moment in paradise thanks to Vacatia. Puerto Morelos is known for its beautiful beaches, great fishing, and terrific diving and snorkeling, and these are just some of the reasons why it's one of the best vacation spots on Riviera Maya. If you want to soak up the Caribbean sunshine and enjoy the laidback vibe of this Mexican fishing village, you should work with Vacatia to find the perfect vacation rental for your stay. Whether you want to stay at one of the best Puerto Morelos all-inclusive resorts or at a smaller resort hotel, Vacatia can help you find exactly what you're looking for. Not only will Vacatia provide you with a resort that offers great services and amenities, but Vacatia's unique rental property will also make you feel right at home. Every Vacatia rental features added space and comfort, including a fully equipped kitchen and extra living area, so you can rest and relax after a long day in the sunshine. Vacatia's here to help you plan your dream beach vacation, so take advantage of Vacatia's great services and start dreaming of your Mexico getaway today! Even though Puerto Morelos is just 20 minutes south of Cancun, it has an entirely different vibe. With a mix of locals and visitors, Puerto Morelos offers a much more easygoing, quiet atmosphere, as opposed to Cancun's crowded beaches and rowdy nightlife. During your stay in Puerto Morelos, you can spend your days snorkeling the National Marine Park, fishing out on the open ocean, and tasting delicious seafood. If you are craving balmy, tropical weather and sweeping views of the Caribbean, you should escape to the charming town of Puerto Morelos. To simplify your trip planning process and enhance the overall quality of your stay, you should work with Vacatia to book your accommodations. 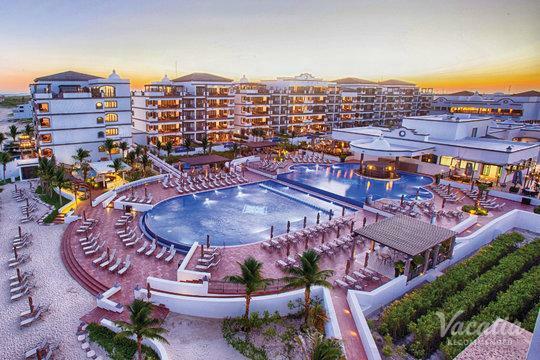 Rather than stay at one of the many Puerto Morelos hotels in the area, you could stay at one of Vacatia's quality resort residences, so you'll feel right at home in the Mexican Caribbean.